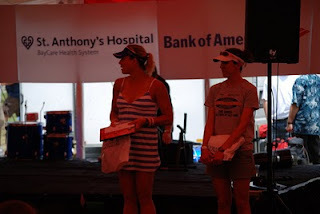 I'm flying to Florida this evening with one of my besties, Alysia, to race in St. Anthony's triathlon. If I'm being completely honest, I'm not feeling super great right now with my training but no matter what, the race will go MUCH better than last year when I was very, very sick. I'm going to go out there and go as hard as I can for as long I can - how's that for a strategy?! The weekend will also be a lot of fun, as it always is down there. Here's a picture from the start of the women's elite amateur wave in 2008 - just a portion of the wave as it was pretty big. I'm in the lower left corner. And in keeping with the St. Anthony's theme today, here's a nice article about my dad that was in the St. Pete Times. 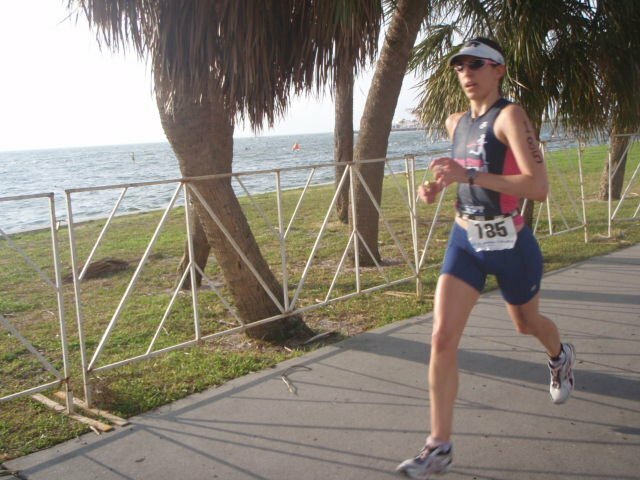 Q&A with president of USA Triathlon board. Here's a good article that captured Wendy's personality. Wendy Johnson, longtime triathlete, race promoter and take-charge good Samaritan, dies at 50. 10 years ago I was having a really rough time in my athletic life – some influencing people were basically killing anything I enjoyed about running. I was finishing up my junior year, on a full scholarship, and pretty much wanted to quit and walk away from it. 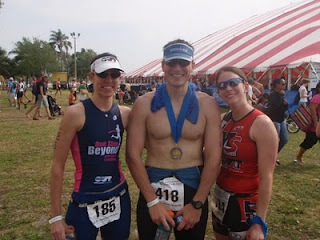 That’s how I ended up getting back into triathlons after having doing a bunch as a youth. My dad suggested participating in some of the central Florida sprints as a way to have fun again while competing. I did have fun; a lot of fun. I met some new people, including a husband and wife that my dad had recently met. 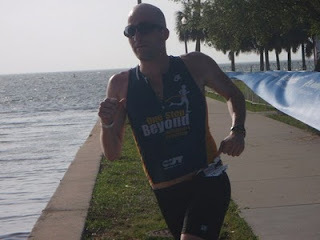 I was finishing up the run of the first sprint triathlon in Clermont when Wendy gave me a shout as she was starting her run. A local elite stud was cooling down chatting with her as they had gotten to know each other through some triathlon forums over the past year. She turned to him and asked if he was single – he was, and she told him that she knew a girl he should meet. So yes, that was Marty, and we have Wendy to thank for setting us up. Her and her husband, Al, were so in love and such nice people – good people, genuine people. I remember when I first met Wendy she said something that stuck with me. As I said before, I was going through a low point – as I was talking to her about what was going on she said, “don’t let someone so unworthy take up space in your head” I could really relate to that and tried my best to stop worrying about someone who was causing me so much anxiety. Wendy lost her battle with melanoma last night. She was 50. She will be missed greatly by many, many people, including Marty and I. Two years ago Marty and Tassie did the Umstead Coalition run. It's one of the few runs that allows dogs and she won for doggies. We couldn't do it last year because it was the same day as the 5280 open water swim, but this year they were on separate weekends. 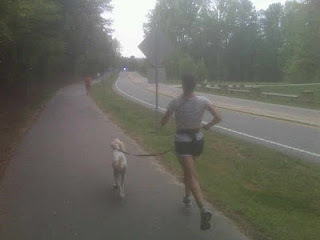 Since Marty was doing the Triangle Orthopedic Sprint triathlon on Sunday, it was me and Tassie for the run. 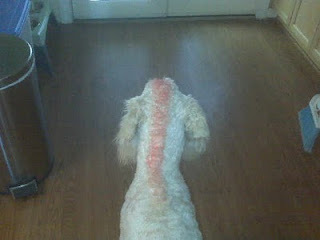 We got her shaved and mohawked-up and then dyed it pink for the run. The run didn't start until 9:45 and I was a little worried because it was starting to get pretty warm. And Tassie was SUPER excited just being at the venue with all the other dogs and people. 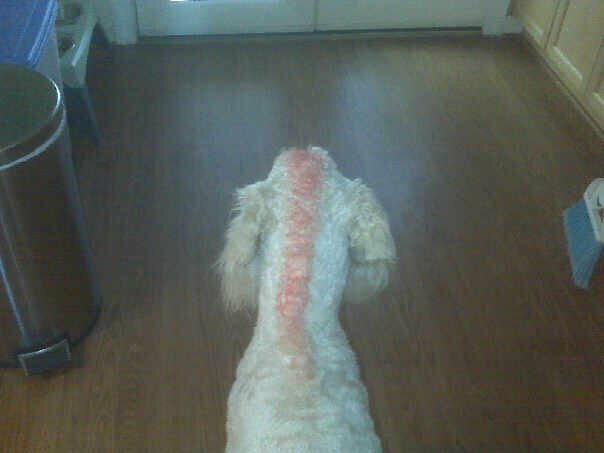 She didn't heed my advice of being a zen-doggie pre-race. The start was a little dicey because there were a lot more people than two years ago, and you have to make a sharp right turn after 30 yards. Tassie was all over the place not exactly understanding what was going on. It took us awhile to get into a groove, and then we saw Marty which activates her ADD as evidenced by this video. This is what I imagine is going through her head: Run Happy! Happy Run! 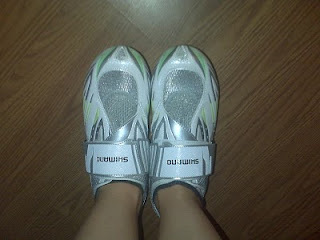 Love Running! Oh HI DADDY! We hit the 3 mile mark in 21:47 and then Tassie was on a mission to pick off as many people as possible. 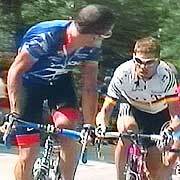 We passed so many people in the last mile (now with a slight uphill) and she totally gave these two guys we passed the "Lance Armstrong Look." I am SO not joking about that! She seriously got some sort of second wind and was mowing everyone down. Marty was trying to run ahead of us here to get a good shot but Tassie wouldn't let him so that's why this is from behind. So yes, she is doggie champion once again. And she got lots and lots of attention from everyone because she is so nice and had the punk rock mohawk. 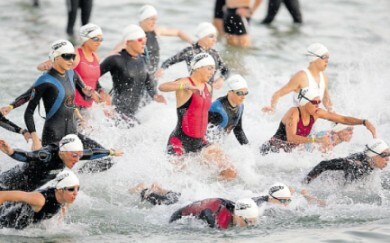 Then this morning she got even MORE attention out at the triathlon. She's a regular celebrity in these parts. This is Marty. I have hijacked Bri's blog. Blogger is discontinuing FTP support for blogs so we need to move Bri's blog to briblog.martygaal.com (which will then go to a google host page), having some technical issues, so if Bri's blog disappears anytime soon you can yell at me. Here is a picture of a goat.